Known for breaking down your favorite sneakers and rebuilding them with high-quality materials, The Shoe Surgeon has revealed his latest creation. This time around the PUMA Thunder Spectra receives a redirection. First, its grey/yellow iteration gets reimagined with silver mirror and wrinkled metallic leathers. Inspired by the “Galena” crystal, the model also incorporates plonge lining while keeping its original outsole. Next up is “The Garnet.” Its original upper is swapped for burgundy waxed pull-up leather and black Italian leather while also adding plonge lining atop of its rubber outsole. 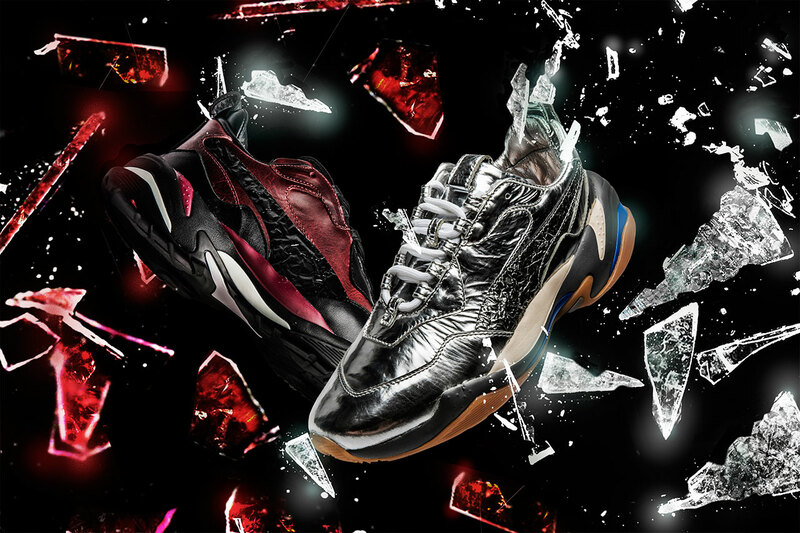 Take a look at the newest takes on the PUMA Thunder Spectra by The Shoe Surgeon and let us know your thoughts. In related news, you can check out his previous work using the PUMA Desert via its “Fire and Ice” pack. Accompanied by never-before-seen footage from the movie.